Meet a Few of Your Biggest Fans! I'm Michelle, and I've been a runner for nearly 10 years; however, the majority of those miles were spent on the road running and training for road races (mainly half and full marathons). It wasn't until I moved to south OC that I was exposed to and fell in love with all the beautiful trails right in my own backyard. After spending some time on the trails, I signed up for my first trail race which just so happened to be the Rock it Racing 10k at Irvine Regional Park where I was the first overall female winner. Since then, I have run many more other Rock it Racing events. I'm a regular face you'll see at our races either volunteering or out on the trails. Hello. I am Nicole, and I live in Rancho Santa Margarita. I have a husband that I have been with for 17 years and two crazy cats. I started running a few years ago just so I could earn a medal. Now I have many medals from doing 5Ks, 10Ks, 15Ks and one half marathon. Since I started running, I have lost 25 pounds. I have been able to keep the weight off by running and making healthy food choices. Now I am hooked! If I am not running you will find me working as a Director’s assistant at a travel agency, snowboarding, or spending time with friends and family. 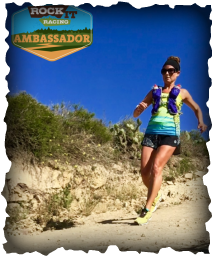 As an Ambassador, I am excited to meet new people and to help spread the word to runners with ALL running abilities that trail runs are a great way to get exercise and a good stress release. Hi there! My name is Hannie, and I’ve been a runner since the early 2000s. I’m very thankful that running has not only led to continuing a healthy lifestyle, but it has also led to meeting my husband and tackling triathlons. I continue to enjoy road races and triathlons, but have a newfound love for trail running. 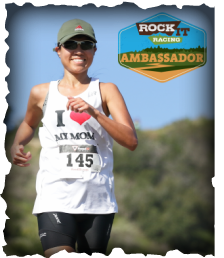 My sister-in-law Janice (fellow Rock It Racing Ambassador) introduced me to my first Rock It Trail Race last year, and we’ve been hooked ever since! The trails offer such a beautiful scenery and challenge like no other. I love that the Rock It Trail series have exposed me to so many wonderful trails and an extraordinary trail running community. The series has also inspired me to take on my first 50k this winter (wish me luck!). I’m a huge fan of good health and fun, so a mix of road races, triathlons, and trail running definitely keeps me on my toes during training! I’m absolutely excited to and cannot wait to rock it with you at the upcoming Rock It Races! I’ve been running for a little over two years. I began in late spring of 2014. I just started to burn off some extra weight from working in restaurants, and to get into shape, but I got hooked. In just a few months, I went from stop-n-go 10 minute miles to a 10k at 8:30 pace and a mile in 6:50ish. I knew I was making progress and I was really enjoying myself. 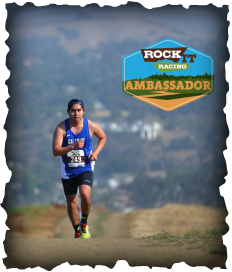 I decided to run the LA Marathon, and even switched careers from restaurant management to something in the running world (part of the management team at Road Runner Sports Laguna Hills). In my training, I discovered the trails. They were life changing. Running became my alone time, my freedom, my place to level my head and figure out my thoughts. It also became my place of discovery. I discovered places in my backyard I had never known were there. I discovered a new community and a new passion. I also discovered rocks. I drilled one on a training run a few months out from LA and it took me out of the race due to a major neuroma and subsequent ITBS. It was heartbreaking, but the charity I was running for (American Foundation for Suicide Prevention) allowed to me transfer what I raised to the next year. I continued training and getting myself fit for the following year. In the span of that year, I started to feel fast and strong with a few good showings at local trail races, a mile P.R. of 5:05, lots and lots of great trails discovered, and lots of new friends. I can’t imagine not being able to go tackle some trails with some good people. 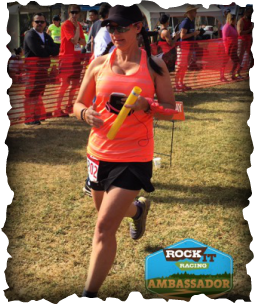 I look forward to an awesome time with Rock It Racing and hope to inspire others to discover their own love for running and the trails. My name is Annie and I love the trails! Especially our very own trails here in Southern California. I’d spend all my time on them if I could. I’ve been running since 2003 and haven’t stopped. I’ve run 5Ks, 10Ks, a ton of half marathons, some marathons, a couple of 30Ks, Ragnar races, sprint triathlons, duathlons, a couple of bike road races (those are a lot of fun too) and one very awesome 50K! I’m currently training for another Ragnar trail race, a road half marathon, and my second trail 50K. Since I can’t seem to get enough of running the trails, I am now dedicating myself to all of those who crave new adventure and who share my love for dirt, rock, root, and beautiful Mother Nature! Trail running is an amazing outlet for the body and mind. 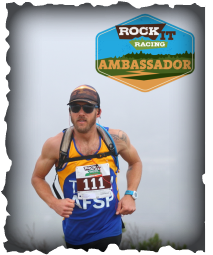 Becoming an Ambassador for Rock It Racing will give me the opportunity to inspire and share my passion with all those who want to explore the trails. Because I know what those trails have to offer. So yeah … I’m ready to Rock It! Are you?!! ​Hello! My name is Kristina. I live in Dana Point, CA along the coast. I am married and have two kids. I am 43 years old and didn't start running until 2010. Since then I have run 7 marathons, 21 half marathons, 16 10k's, 22 5k's, 3 Ragnar Relays, and one 50k. And I am not done yet. My goals going forward are to hit more trails and more ultras. I mac urrently training for my 2nd 50k. When I am not running you can find me surfing with my family and practicing yoga. I am currently on a yoga streak. Looking to see you all out on the trails. Hey there! My name is Michael. I’m 25 years old, and have been running for over 12 years! I was fortunate to run in college for Concordia University in Irvine. Post-graduation has allowed me the athletic freedom to pursue trail running. I've been competitively running everything from 5Ks to half marathons. I’m a firm believer that running can change your life, and trail running provides the spiritual outlet we all need to cope with the day-to-day. When I’m not running you can find me coaching my middle-school runners , hiking, and managing a store for a notable running company, Asics. 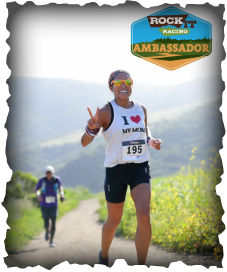 My goals include sharing my passion for running and the love that running provides to neighboring communities, and serving as an ambassador of all the amazing trails that Southern California has to offer. 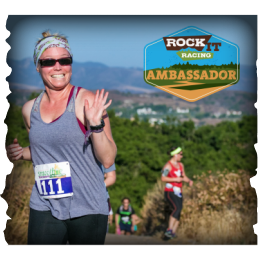 I love Rock it Racing because it's a true embodiment of what trail running can offer; having a killer time, while embracing some of the most majestic views that only trails can provide. So get a rocking attitude, a killer squad, and join us for a adventure. The trails never disappoint. Be happy. Run Trail! ​Hello! My name is Suzie. I’m an RRCA and USTAF Certified Running Coach. I currently coach the 5k, 10k and Half Marathon groups for A Snail’s Pace Running Academy in Brea. I have been running off and on since high school but only recently returned to active running in 2014. Since then I have run three half marathons and two Ragnar Relays. 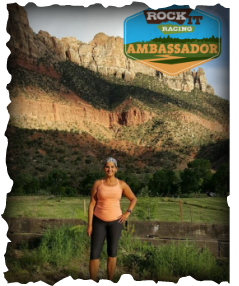 I especially loved the Trail Relay in Zion. I prefer running trails over the road. I mostly run 5ks and 10ks, preferring the shorter distances so I can do several races a month, I have done too many to keep count. When I’m not running or coaching, I’m hiking and doing yoga. Working part time for A Snail’s Pace Running Shop keeps me connected to all things running. My ultimate running goal is to run a 50k before I turn 50 and work in the race directing field. 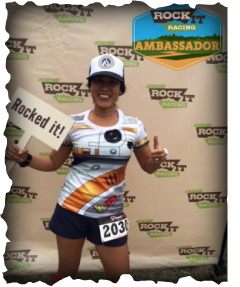 Hello, my name is Janice and I’ve been rockin’ it with RIR since the November 2015 event at O’Neill Regional Park. I’ve completed a total of 6 events including the 2016 Winter Series, and am working on the 2016 Smoothie Tuesday series. I’ve been surrounded with running, exercise and sports my whole life and began running for fitness in 2009, and started running half and full marathons since 2011. After hitting a few trails last year including one of my favorites, Limestone Canyon, I thought it would be fun to explore trail races. I had so much fun at the O'Neill race, something sparked in me that I just wanted to run more trails and see more views! One of the things I love the most about Rock it Racing is it combines 2 of my favorite things, my enjoyment for running and exploring our local OC Parks. The race environment is fun, laid back and for everyone: run it, hike it, rock it! When I’m “off” the off-road, I like to assist in race event’s by offering volunteer support. You can also catch me training with husband and my family, whether it be running, swimming, biking or gym work outs. See you out there!